The source of the laws and traditions of Judaism is the Torah, which is also the Old Testament Bible of Christianity. The Torah begins with the story of Creation and the Garden of Eden and continues with the events in the lives of the prophet Abraham and his descendants. Moses is believed to have written these works during his lifetime, from 1525-1645 BCE. The Jewish observance of Shabbat is symbolic of the Story of Creation in the Book of Genesis when God created the world in six days and rested on the seventh. It’s one of the most ancient traditions of Judaism, believed to have been commanded by God when Moses received the Ten Commandments on Mt. Sinai. From Friday to Saturday evening no work is permitted. Families gather to light candles and recite blessings over simple foods like wine, bread, and vegetables prepared the day before. The day is spent with family, quietly focusing on the Jewish faith and a person’s relationship with God. Rosh Hashana is the beginning of the Ten Days of Repentance. It’s a day of remembrance, a celebration of the cleansing away of sins from the passing year and praying for happiness and prosperity in the year to come. The tradition originates in Leviticus 23:23-25, when God commanded a day of rest on the first day of the seventh month of the Jewish year. In 2019, Rosh Hashana begins on September 29. On the night before Rosh Hashana, families gather to share a meal of traditional Jewish foods. 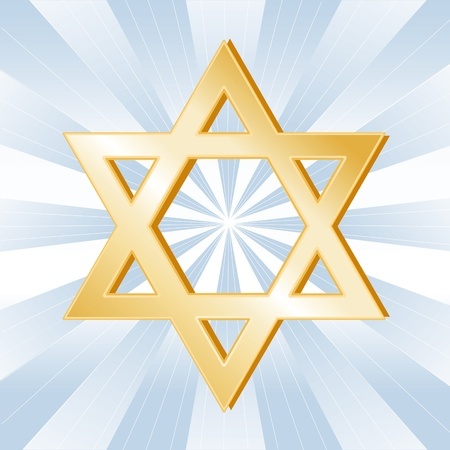 Blessings are recited over the wine, soup, Challah bread, and sliced apples and honey that symbolize the spiritual nourishment of the Jewish faith. The day of the New Year is spent at Temple, praying and studying the Torah. The sound of the shofar encourages contemplation of the sins of the past year, regrets that are symbolically “cast off” by throwing pieces of bread into a nearby stream or creek. According to Jewish tradition, a person’s good deeds and bad deeds are placed in the balance as the Days of Repentance continue. Yom Kippur concludes the Days of Repentance that began with Rosh Hashanah and continued for ten days. This day of Atonement is from Leviticus 23:26-28, when God commanded Moses and the Hebrew people to gather together and to pray that they had successfully repented of the sins from the previous year and could look forward to a New Year of happiness and prosperity. Traditionally it’s a day of solemn prayer and fasting, and it’s the most important day of the year for a person of the Jewish faith to attend synagogue. A final sounding of the shofar concludes the celebration. Yom Kippur is on October 9, 2019. Though most other Jewish holidays originated within the books of the Torah, the events surrounding the Festival of Lights occurred in a series of battles from 161 – 167 BCE, as the Jews, led by Judas Maccabee and his brothers, rebelled against the Greek army and took control of their holy temple in Jerusalem. The celebration of Hanukkah occurs on the twenty-fifth day of the third month of the Jewish year, this year from December 23-30. Families gather to exchange gifts and play games, enjoying traditional meals of potato latkes and other fried foods. 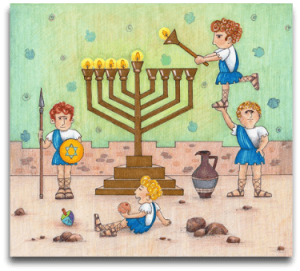 The candles of the Menorah are lit in remembrance of the rededication of the temple and the small flask of lantern oil that burned for eight days. Passover is celebrated in remembrance of events within the Book of Exodus. In the year 1445 BCE, God commanded Moses to lead the Israelite people to a “promised land.” The Egyptian Pharoah first had to agree to free the enslaved Israelites, so God cursed the Egyptian people with ten plagues, the last of which was the death of every first-born son. The Israelites were told to paint a symbol on their doorways so this last plague would “pass over” their families. Passover lasts for seven days, beginning with the Seder, a meal including unleavened bread which was symbolic of the Israelite people preparing for a journey and leaving Egypt before their bread had time to rise. The holiday is both somber and festive, an occasion to celebrate the freedom of the Israelites while remembering their years of slavery. In 2019, Passover begins on the evening of April 19 to April 27th. The prophet Moses is said to have written the Torah, the first five books of the Jewish Tanakh and the Old Testament Bible of Christianity. His place in history is a familiar narrative that began 3500 years ago and symbolizes the beginning of the relationship between God and the Israelite people. In 1500 BCE, Egypt was ruled by a Pharaoh who had enslaved the Israelites, forcing them to build temples and monuments from stone that was transported miles across the desert landscape to settlements along the Nile River. To keep the Israelite population under control and prevent any future uprisings, the Pharaoh had ordered every newborn Hebrew male to be killed. 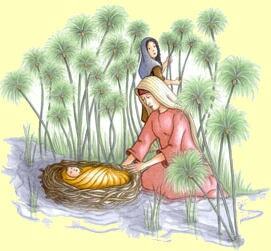 Moses’ mother placed him in a basket afloat on the Nile River where he drifted downstream and was found by the Pharaoh’s daughter. Moses was raised as an Egyptian but sympathized with the Israelites and the cruel treatment they received from the Pharaoh. One day, when Moses witnessed an Egyptian soldier harshly beating one of the workers, he killed the soldier and then fled into the desert to escape the Pharaoh’s wrath. God spoke to Moses and instructed him to return to Egypt, free the Hebrew people and lead them to a new land. To help convince the Pharaoh to let the workers leave, God cursed the Egyptians with ten plagues that included swarms of flies and locusts, an outbreak of boils, and three days and nights of darkness. Pharaoh relented and let the Israelites leave, then changed his mind and sent his men after them. As God parted the Red Sea, Moses and the Israelites made it safely across just as the waters crashed down around the Egyptian soldiers. Moses led the people through the mountainous desert, stopping at Mt. Sinai where God again spoke to Moses. This time God told Moses that he would lead them to a “promised land” where they could prosper and grow if they could agree to follow his laws. Moses received the Ten Commandments, carving them into two stone tablets. God continued to test the people’s faith. After years of traveling through the desert, Moses passes away at age 120 just as the Israelites were about to enter the Promised Land. The 290 mile stretch of land on the shores of the Mediterranean Sea has been fought over for centuries. This historic conflict has it’s origins in the books of the Torah, involving a land known as “Caanan” that correlates with the modern-day regions of Israel and Palestine. According to these writings, God promised these lands to the prophet Moses, instructing him to lead the Hebrew people to a place where they could raise their families and follow the laws of Judaism. Today, the cities, lakes, and ancient shrines in the region are sacred to the Jewish people as well as to the followers of Islam and Christianity. The boundaries of the surrounding countries have shifted through the centuries, and from 900 – 570 BCE the region of Israel was part of the Assyrian Empire that included modern-day Syria, Lebanon, Egypt, and Jordan. During this era, the prophet Muhammad was said to have ascended to heaven at the site of the Temple Mount. The Romans conquered these lands in the fifth century BCE, and in 160 BCE they met with a hostile rebellion led by the Maccabees, a Jewish militia that fought to regain control of the temple in Jerusalem. The Romans were in control of the region when the events of the New Testament took place, as the Christian prophet Jesus was born in Bethlehem, raised in Nazareth, and put to death in Jerusalem around the year 30 BCE. For the next thousand years, the lands sacred to Judaism, Islam, and Christianity were attacked and conquered by various Arabian empires. Following the Ottoman rule lasting from 1500-1800 CE, the modern-day era of the Israeli-Palestinian conflict began. The Zionist movement, led by Theodor Herzl in the late 1800’s, sought to establish a Jewish homeland in response to discrimination against the Jews in parts of Europe. The Balfour Declaration of 1917 was a pact by Great Britain, in control of the region during WWI, granting the Jewish people the right to create the state of Israel. During the years leading up to WWII, though, the British began to restrict migration to Israel at a dangerous time in history when the Jews living in Europe were being targeted by the Nazis. The surrounding Arab nations attacked Israel a year later. Though Israel’s military was newly formed, they managed to fight off invading armies from Egypt, Syria, and Jordan. After a year of fighting, more than 500,000 Palestinians were forced to leave as millions of Jews migrated into Israel’s expanded boundaries that now included 30% more land than was granted to them by the UN. 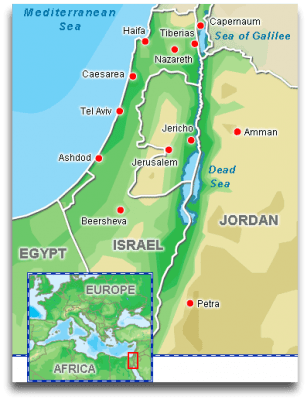 In 1967, Israel again fought the Arabs in the Six Day War, controlling the Sinai Peninsula to the south and the West Bank and Golan Heights to the north. During the 1970’s and 80’s, Israel retreated from these regions but continued to create Jewish settlements within Palestinian territories in defiance of the UN and international law. The violence from the Israeli-Palestinian conflict escalates into acts of terrorism in that region as well as in other parts of the world. Is a two-state solution possible? Could both sides agree to a nation with equal rights for each of its citizens … rights that include freedom of religion and shared access to the sacred cities and holy shrines that have been fought over for centuries?